Lake Erie yellow perch are plentiful and easy to catch. 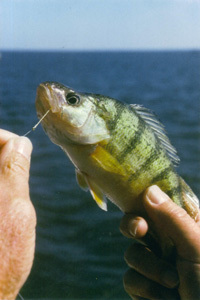 "Perch Jerking" is fun and requires the simplest of fishing techniques. Size ranges from 8 to 13 inches. The best action and highest catches are found in April and again in August through October. Best fishing method of anchoring and using two or three hooks attached to a perch rig or spreader and weighted with a sinker up to 1 ½ oz. Baited with emerald shiners and dropped to the bottom.